Bouquets are gorgeous, but how long do they last? These great Valentine’s Day gift ideas for her are all about longevity – just like your love. Check them out! This Valentine’s Day, we recommend you attempt to do something different. You’ve likely given gifts of flowers before, and maybe candy. But those are soon gone, and it can be a little sad seeing wilted flowers. Instead, try to give a gift that can go the distance. Great Valentine’s Day gifts for her can go beyond the classic chocolate and flowers, but where did those even come from? Where did the tradition of flowers start as a Valentine’s Day gift? There have been many cultures that have used flowers during mid-winter rites. Specifically, they were often used to symbolize fertility and love. The origins of Valentine’s Day are a bit murkier. In one legend, a young Roman priest named Valentine was put to death on February 14. His alleged crime? Secretly marrying couples after the Emperor decreed single men made better soldiers. While in jail, as the story goes, he fell in the love with his jailor’s daughter. His final letter to her may have been signed “From Your Valentine”. One confirmed fact is that Valentine was granted sainthood in the 5th century, and he eventually becomes one of Europe’s most popular saints. (St.) Valentine’s Day is still an incredibly popular, but sometimes stressful, holiday. So if you’re looking for great Valentine’s Day gift ideas for her that will go the distance but aren’t stressful to obtain or make, here’s your list. No matter what the lady in your life is into, these great Valentine’s Day gifts for her will make this year one to remember. We definitely like Eternity Roses as a romantic gift that will go the distance…. While a bouquet of roses will fade quickly after Valentine’s Day, you can actually give her one that won’t. 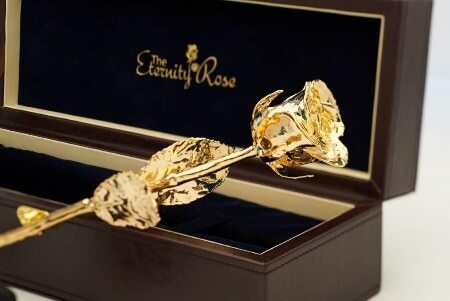 This preserved 24 karat gold-dipped real rose will be beautiful forever, just like she will. They look impressive and are made from a natural single rose. 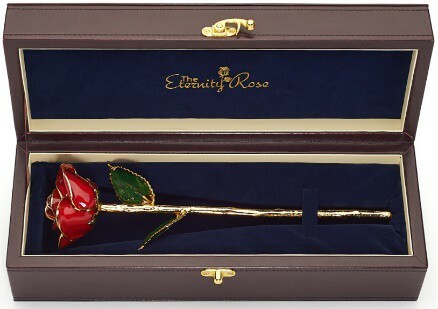 The manufacturer also has glazed red single roses in which look quite stunning in a nice leather presentation box. A romantic date or trip can be fun, but it takes a little planning, though all the fun goes out the window if you struggle with planning. Whether it’s a trip around the world, or just across town, it should be enjoyable for both of you. Here are some tips from The Eternity Rose that will help you to plan and enjoy Valentine’s Day. Think of all the reasons you love her. Pick your favorite, and create an 8×10 print. Grab a pretty frame, and you’re almost done. She can hang it on the wall, so she’ll see it every day. Make it a frame with a stand, so she has the option to put it on her desk at work, too. Sometimes great Valentine’s Day gift ideas for her are the simplest. If you’re less artistic, but still want a custom message, grab your Scrabble board. Pick tiles out to arrange your partner’s name, crossed with yours. A deeper frame will allow room for the tiles and makes a fun 3D and romantic gift. Candles are pretty, romantic, and come in a range of colors and scents. Take it to the next level and carve your sweetie’s initials into it. It’s easier than carving up a tree and better for the environment. Follow this simple tutorial to make a unique gift for her. Knowing the things your loved one loves is part of being in a relationship. What’s the song she sings most often? The one you hear her humming under her breath when she’s happy? Write down the lyrics of that tune and make her a personalized lyrics plate. She can enjoy her favorite meal and her favorite song at the same time (it’s even dishwasher safe). If your spouse prefers a physical calendar to the one on her phone, make her one she’ll love. Grab her favorite photos and create a wall calendar. Match each photo to the month it was taken. Add a caption that shares your favorite thing about the photo or memory. Now it’s not just a calendar, it’s a romantic gift she’ll see year-round. If your partner has a green thumb, why not give her something she’d enjoy all year? Grab a pretty basket and fill it with packets of her favorite kinds of flower seeds. If you don’t have a flower bed, throw in a few cute pots she can use. Every time the flowers bloom she’ll think of your thoughtful gift. If you do have a yard or garden, make a few unique stepping stones to guide her way. Use items like shells from a trip you took to the beach, or glass stones in her favorite colors. This will take a little extra prep time to allow them to set, but these instructions make it a snap. Think of three places that you’ve been together that have been romantic and fun. This is an especially good gift if it happens to be around your first anniversary, too, which is paper. Grab a map and a red marker. Draw a heart around each place. Depending on how well-traveled you’ve been, you may have to trim your map down a bit. Find a frame that fits (your local craft store can help with a custom one, too). She can look at this unique gift, a map of your love, every day of the year. If you’re good with tools, consider making the frames for the ideas above instead. Or, has her book collection overflowed the shelf and onto the floor? Build her a new bookcase. Does she have kitchen gadgets or spices that don’t have a permanent home? Build a small rack that matches her kitchen. If you’re good at more intricate design, a jewelry box or necklace tree might be just the perfect romantic gift. Is there a room that you know needs a fresh coat of paint? It’s probably the same one she thinks needs it, too. If you know she’ll be out of town, surprise her by doing the chore you both likely hate. Or, if a surprise doesn’t work, give her a certificate that says you’ll paint a room of her choice. If writing is your thing, why not write your love story? Use some parchment paper, and a calligraphy pen or marker. Describe how you met and how things have grown between you. Leave a few blank pages at the end and mark the first one, “The future”. Punch two holes (top corner, bottom corner) and bind it with a pretty ribbon. Next year, you can go back and fill in another page. Give her a romantic gift that will be hers all year long, not just for a few days. 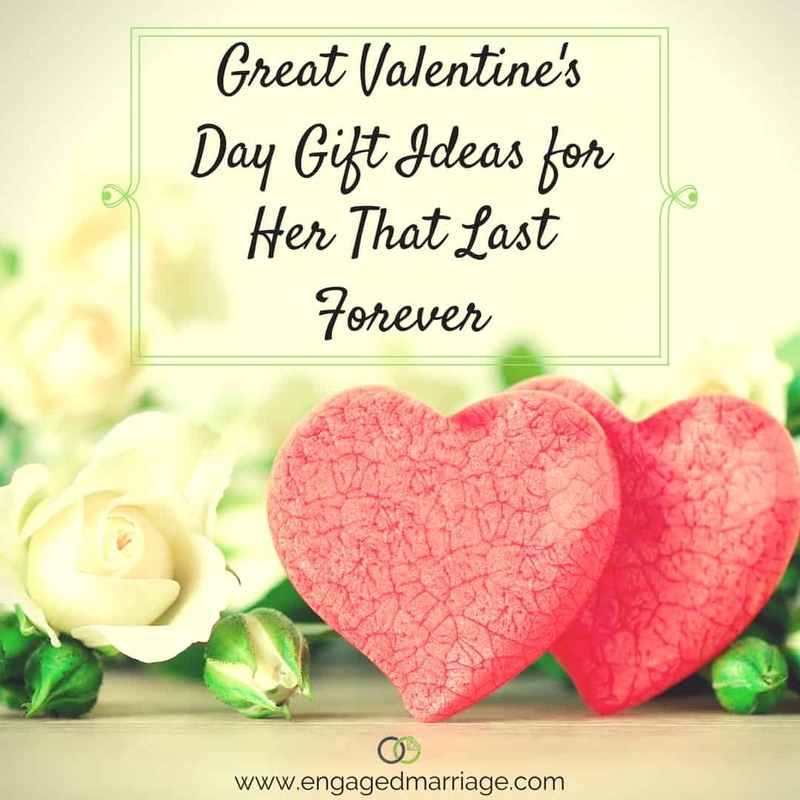 Like these great Valentine’s Day ideas for her or have other ideas we should include? Share your thoughts! Dr. Carissa Coulston is a Clinical Psychologist with over 30 research publications in high standard medical and psychiatric peer-reviewed journals. She has experience in managing a wide range of problems within the Psychology spectrum from common everyday issues such as stress and anxiety, to more chronic and severe mental health conditions. Carissa writes a regular blog on relationship management and helps people deal with various problems they face in relationships, offering advice on how to resolve difficult situations, strategies to cope with and move past painful and disappointing experiences, and tips on how to improve the overall quality of relationships to achieve happiness and fulfillment.